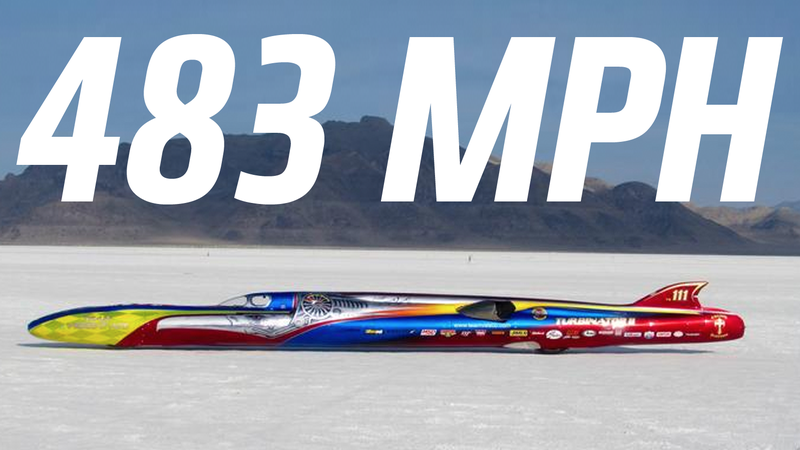 I was out at the Bonneville Salt Flats this past week to drive some old and slow cars fast-ish on the salt, but while I was there puttering around, something much more important happened: Team Vesco’s Turbinator II set a new world record for a wheel-driven car, an insane 483 mph. I actually saw the run happen, way out on the horizon, and it sounded like a jet plane taking off. The Turbinator II is powered by a turbine engine from a Chinook helicopter, but unlike other jet-powered speed record cars, that turbine isn’t providing thrust to push the car along, it’s actually driving the wheels directly, which is what makes this record so significant. This past week was the World of Speed, a slightly smaller gathering of sodium-loving drivers and cars, and it’s notable in that everyone I spoke with there mentioned that the quality of the salt surface was the best they’d seen in decades. Hard, smooth, minimal ridges or dips, pretty much ideal. And that may be why they were able to get that absurdly fast run. “Traction is the key to getting the power to the ground through the wheels without excessive tire spin. State-of-the-art traction control and electric fuel control systems have been upgraded and modified based on data from last month’s Speed Week runs. Watching that thing, even from the long distance away in the pits, shoot across the horizon was incredible; it covered two football fields every second. Hopefully they’ll hit the even more insane 500 mph record soon!